O'Hare's Ghost: Whatever Happened to Terminal 4? Editor&apos;s note: A Curious City podcast episode features this story, beginning at 5 minutes, 25 seconds. You can subscribe to the podcast on iTunes or through Feedburner. O’Hare International — our area’s flagship airport and one of the nation’s busiest — is the nexus for more than just travel; judging by the number of questions Curious City receives about ORD, it’s a center of mystery as well. We’ve answered a question about whether there’s an aviary on the airport’s grounds, but we’ve also been sent more bread-and-butter questions about the airport, such as what impact it may have on property values and development. The sheer number is not a complaint (we encourage you to ask your own O’Hare-related question, by the way! ), but more of a setup to introduce the question that’s had more versions of it asked than any other. It was pretty much random luck that we picked this particular one from teacher and writer Tim Troemner of Prospect Heights. But it’s a good thing we took on Tim’s version of this question since, he later told me, this mystery has been his “lifelong concern.” Given that he’s thirty years old, he’s really applied the pressure to put this question to rest! Well, the answer’s not deep, but it is interesting, and it’s got a kicker, to boot: There’s an easy way to find the former whereabouts of the elusive, now ghost-like terminal. The way O’Hare is set up now, Terminals 1, 2 and 3 are on one side, while Terminal 5 is way off on the other — almost like a thumb. But in this metaphoric hand, the forefinger is missing, and that’s the former site of Terminal 4. Chicago Department of Aviation spokeswoman Karen Pride says there was a Terminal 4 ... once upon a time. “It was a temporary international terminal here from about 1985 until 1993,” she said. Let’s back up a bit. Just before 1985 O’Hare had three terminals, but United Airlines wanted more space and the airport was taking on more international travel. So the international terminal, (Terminal 1), became United’s hub. Terminals 2 & 3 stayed domestic. Terminal 4 was assigned to international flights. According to David Woodcock, whose 50-year career at O’Hare included a stint in Terminal 4 as Scandinavian Airlines’ station manager, designers panned Terminal 4 as soon as it was opened. Among other things, Woodcock says, the foreign airline companies found the operating area too small, and there were problems coordinating bus traffic through the site, too. Airlines and designers quickly began planning a new international terminal, which opened as Terminal 5 in 1993. Terminal 4 was quietly closed, having been a victim of the march of progress to Terminal 5. But what about the numbers? O’Hare still had terminals 1, 2, and 3. Why didn’t they just call the newest terminal, Terminal 4? “That would’ve been more confusing,” said O’Hare’s Karen Pride, adding that travelers at the time who were familiar with the old Terminal 4 would have headed to the wrong location. And maybe there’s no need to keep an obsolete number. 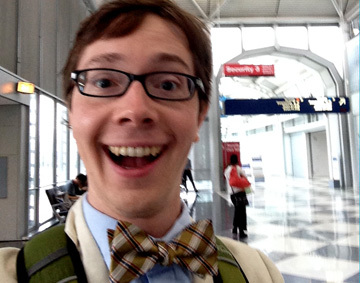 As pointed out by Woodcock, a traveler is really only concerned with a single location — the terminal mentioned on their ticket. But the number 4 hasn’t completely disappeared from O’Hare, and therein lies the possibility of some confusion. 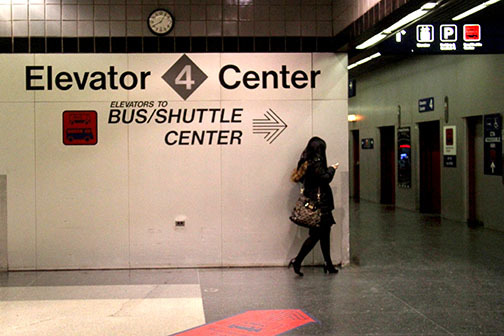 There are signs displaying the number 4 at O&apos;Hare; however, they&apos;re associated with a bank of elevators near a parking garage and the airport&apos;s current-day bus terminal. That puts "Elevator Center 4" close to the former site of airport Terminal 4. Maybe the elevators&apos; numbering is a subtle joke about the old Terminal 4, one that can still make some O’Hare workers smile.